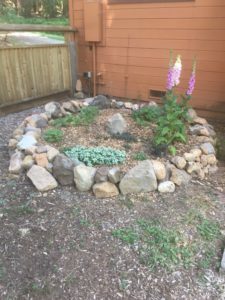 Another example of moving beyond a rock pile to create a garden! We do a lot of service. I live on a spiritual Sanctuary which is 88 acres and there is a lot to do. I have been developing and expanding our landscaping as well as enlarging a holy site we have here. It is the site where we celebrate Guru Purnima which is a celebration of Gurus all over the world including our own. The consideration of what is Service and also what is Sacred Art is fresh on my mind. Many times I am doing service as work. I am starting to sniff a difference of what is and what isn’t. In my experience service is doing a project or task as something that benefits multiple people. It is done with happiness and self transcendence. Meaning you have to go beyond your small self and limitations to accomplish it. It may be physical or mental ideas or places where we tend to stop short. Because of fear of failing the ideas and inspiration get blocked and nothing moves. I now want to add sculptures that inspire people and help them feels something of Spirit or God which might be called real art. I am still figuring this out and will report back on what I come up with as I feel into it. This so much more fun than doing something where I want or need praise. Its like the self has to get out of the way to let something greater come to the fore. To be continued! 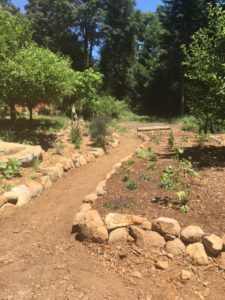 Here is a place where we had to move lots of dirt and stones to create this bed on the right. Still in process!